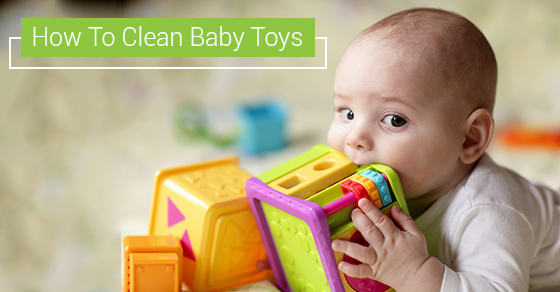 How Well Are You Cleaning Your Baby’s Toys? Toys come into contact with all sorts of grime, dirt and germs as they are hurled, hauled, dragged and kicked about the house. Even after cleaning them, it is only a matter of time before they are once again covered in dirt. It can be quite a tedious task, but that is one of the responsibilities of a parent or babysitter. While most parents are absolutely comfortable with the hassle, many of them do not know how to wash toys correctly. It may seem negligible, but how you handle different materials and sizes of toys carries a great deal of weight. Below is a guide on how to clean toys with respect to their size, material and other factors. For small toys without batteries, dip them inside a washbasin with warm water and a mild detergent and scour them thoroughly with a soft cloth. Rinse them with warm water to ensure all the soap washes off. You can also use the dishwasher if the toys are plastic. For toys with batteries stick to hand washing. For larger toys, clean the surfaces with soapy water and rinse with warm water to wash off all the soap. Avoid sun-drying if possible, as this bleaches the toy and reduces its lifespan. The above methods can basically be applied to all plastic toys. Wash fabric ones in the washing machine with hot water and soap, rinse and place them in the dryer or hang them out to dry. Firstly, however, study the care label to identify any special washing directions. Carved toys only need to be wiped thoroughly with a wet cloth dipped in disinfectant. Immersing them may offset rotting and should thus be avoided. Always wear gloves when using sanitizing solutions, as most of them contain bleaching compounds, albeit in diminutive amounts. More care should be observed when cleaning this type of toy. The most recommended germ removal method is to dip them in boiling water for to 10 to 15 minutes before letting them cool off. An alternative method, which is unfortunately less effective, is the use of a concoction of water and vinegar or water and bleach; this method applies for toys that cannot endure the high temperatures of boiling water. Regardless of the material or size, all baby toys should be cleaned at least once every five days to ensure the baby is happy, and at the same time, safe from the perils of dirt. Always ensure you are conversant with the washing instructions laid out by the manufacturer to avoid any regrettable decisions.